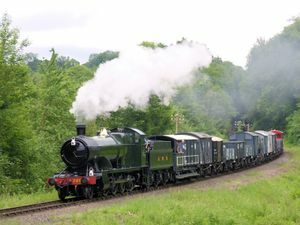 There are over one hundred goods wagons based on the SVRSevern Valley Railway, dating from the 1880s to the 1980s, with examples from all four post-grouping railways, plus many pre-grouping, private owner and BRBritish Rail or British Railways wagons. Most are preserved for historical interest, although others such as ballast or rail wagons perform a useful function on the railway. While most wagons are in long term storage awaiting restoration or on static display at a fixed location, they are, by their nature, mobile, so any reference to current location is potentially inaccurate or out of date. 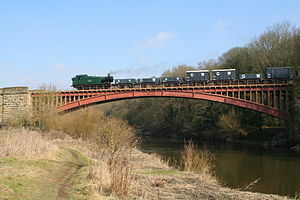 Most of the wagons used in the Demonstration Goods Train are stored at Bewdley. Goods wagons are currently all stored in the open. A scheme to build a storage shed at Bewdley in the cutting of the former Stourport Line proved abortive. More recently a group was formed, known as the Wagon Review Group to try to revitalise this important project to improve display and restoration facilities and to provide much needed cover for at least part of the wagon fleet. Cranes, crane runners and other miscellaneous items of rolling stock can be found under Other rolling stock. 143 Tool/Packing Van 1913 Bewdley Static use Used as stores by the Great Western (SVR) Assoc. 37 Open Wagon Ex-British Sugar, in Lothian Coal Co. livery. 37 is a fictitious number. 967526 'Parr' Bogie Rail Wagon Bewdley As delivered 14 December 2017 In use by P.WayPermanent Way Dept. 967577 'Parr' Bogie Rail Wagon Bewdley As delivered 14 December 2017 In use by P.WayPermanent Way Dept. 972299 'Rudd' Ballast Wagon 1958 Operational In use by P.WayPermanent Way Dept. 972345 'Rudd' Ballast Wagon 1958 Operational In use by P.WayPermanent Way Dept. 972349 'Rudd' Ballast Wagon 1957 Operational In use by P.WayPermanent Way Dept. 972359 'Rudd' Ballast Wagon 1958 Operational In use by P.WayPermanent Way Dept. 972378 'Rudd' Ballast Wagon 1957 Operational In use by P.WayPermanent Way Dept. 972407 'Rudd' Ballast Wagon 1958 Operational In use by P.WayPermanent Way Dept. 972416 'Rudd' Ballast Wagon 1956 Operational In use by P.WayPermanent Way Dept. 972467 'Rudd' Ballast Wagon 1955 Operational In use by P.WayPermanent Way Dept. 972469 'Rudd' Ballast Wagon 1958 Operational In use by P.WayPermanent Way Dept. 972513 'Rudd' Ballast Wagon 1956 Operational In use by P.WayPermanent Way Dept. 972548 'Rudd' Ballast Wagon 1957 Operational In use by P.WayPermanent Way Dept. 972655 'Rudd' Ballast Wagon 1958 Operational In use by P.WayPermanent Way Dept. 972677 'Rudd' Ballast Wagon 1958 Operational In use by P.WayPermanent Way Dept. 972688 'Rudd' Ballast Wagon 1957 Operational In use by P.WayPermanent Way Dept. 972724 'Rudd' Ballast Wagon 1957 Operational In use by P.WayPermanent Way Dept. 980083 ‘Seacow’ 40t Bogie Ballast Hopper 1981 Operational In use by P.WayPermanent Way Dept. 980098 ‘Seacow’ 40t Bogie Ballast Hopper 1981 Operational In use by P.WayPermanent Way Dept. 980142 ‘Seacow’ 40t Bogie Ballast Hopper 1981 Operational In use by P.WayPermanent Way Dept. 980220 ‘Seacow’ 40t Bogie Ballast Hopper 1981 Operational In use by P.WayPermanent Way Dept. 980239 ‘Seacow’ 40t Bogie Ballast Hopper 1981 Operational In use by P.WayPermanent Way Dept. 983115 'Dogfish' Ballast Hopper 1957 Operational In use by P.WayPermanent Way Dept. 989098 'Mermaid' Ballast Wagon 1959 Operational In use by P.WayPermanent Way Dept. 991124 'Tunny' Ballast Wagon 1950 In use by P.WayPermanent Way Dept. 992329 'Mackerel' Ballast Hopper 1951 Operational In use by P.WayPermanent Way Dept. 993898 'Shark' Ballast Plough Brake 1957 Operational SVRSevern Valley Railway Charitable Trust In use by P.WayPermanent Way Dept. 996730 'Gane A' Rail Carrier 1950 Bewdley Operational In use by P.WayPermanent Way Dept. LNWRLondon & North Western Railway 76738 4-Wheel Tranship Van Kidderminster Cosmetically restored Stored in Kidderminster Carriage Shed. 76738 is a fictitious number. HW 410 'Herring' Ballast Hopper 1938 In use by P.WayPermanent Way Dept. HW 411 'Herring' Ballast Hopper 1938 In use by P.WayPermanent Way Dept. HW 436 'Herring' Ballast Hopper 1965 In use by P.WayPermanent Way Dept. LUL 531004 Bogie Rail Wagon 19?? In use by P.WayPermanent Way Dept. British Sugar 136 Open Wagon 1946 Kidderminster Awaiting overhaul SVR(H) Stored at Kidderminster Railway Museum. 136 is a fictitious number. British Sugar 16053 Open Wagon 1937 Kidderminster Restored SVR(H) Stored at Kidderminster Railway Museum. Cadbury's 346 Steel Body Covered Wagon 1961 Bewdley Restored Constructed on frames of much older wagon of unknown origin. This page was last modified on 10 April 2019, at 15:17.